Recipe for Carrot Oatmeal Cream Pies a twist on the classic Little Debbie Creme Pie. 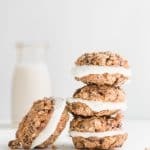 Flavorful oatmeal cookies packed with shredded carrots and sandwiched with lemon zest cream cheese frosting! Easily freeze individual cookie sandwiches for several months. In medium bowl stir together sifted flour, oats, baking powder, cinnamon and salt. In a separate smaller bowl whisk egg, vanilla, and coconut oil until thoroughly combined. Pour wet ingredients into flour mixture and stir to create cookie dough. Cover bowl with plastic wrap and set in fridge to chill for 1 hour to set. Chilling allows oats to absorb moisture and create a better rise. Using an ice cream scoop plop balls of cookie dough onto pan spacing 1.5-2 inches apart. Bake at 350 F for 12-14 minutes until slightly golden on edges. Combine all ingredients into a clean stand mixer bowl. On medium with whisk attachment, whip until creamy. Take a piping bag and fill with frosting. Trim just the tip of off your bag with scissors. Flip one cookie upside down. Begin piping in the center and spiral slowly outward until entire face of cookie is covered. Place second cookie on top of icing to create sandwich. Store cookies in the fridge for up to 2 weeks. Freeze individually by wrapping twice with plastic wrap and once with aluminum foil.